While many Minneapolis City councilmembers are sweating out the election cycle, Cam Gordon is resting a little more easily these days. That’s the luxury of having no formal opposition in his bid for re-election to the 2nd Ward Council seat. Gordon, whose ward covers most of the University of Minnesota area and a few surrounding neighborhoods, is the only unchallenged councilmember in this year’s elections. But an open path to re-election hasn’t led to laziness. The two-term Green Party member is using the extra time off the campaign trail to focus more on current and future initiatives. “It gives me time to plan and organize on issues that I care about,” Gordon said. With less time spent campaigning, Gordon said he’s working on limiting racial inequality, increasing sustainability and helping to re-draft the city’s climate action plan. In many ways, Minneapolis’ 2nd Ward is a perfect fit for Gordon. 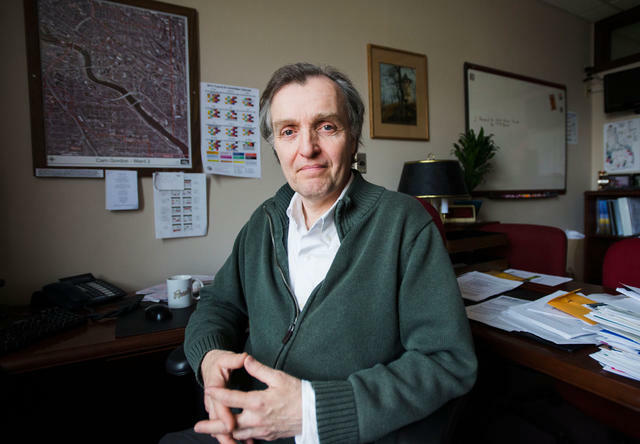 With the University and the Seward and Cedar-Riverside neighborhoods, the district also puts a premium on social and economic justice, Gordon said. “The values that I have are shared by the vast majority of people in the ward,” Gordon said. The ward also includes its fair share of young constituents, with students at the University and Augsburg College. Gordon said he’s had the chance to work with students on a variety of issues. He partnered with students and the Minnesota Public Interest Research Group on a recycling ordinance for commercial business owners. A University student noticed Stadium Village bars weren’t required to recycle. He went to MPIRG, which then worked with Gordon to develop a substantive recycling program, said MPIRG executive director Josh Winters. The City Council approved the ordinance in 2011. Gordon said he’s also worked with students on housing ordinances and is looking forward to an exciting next four years for the area if he’s re-elected. Twelfth Ward City Council Democratic-Farmer-Labor Party candidate Andrew Johnson, who hopes to become Gordon’s colleague in November, said the 2nd Ward is lucky to have the Green Party member. “He’s done a fantastic job representing his ward and Minneapolis as a whole,” he said. Though Gordon coasted to re-election in 2009 with 84 percent of the vote, his two previous elections were a lot tougher. In 2001, he lost to DFLer Paul Zerby by 108 votes. Four years later, he defeated DFLer Cara Letofsky by 141 votes to win the open seat. After having trailed in the primary election two months earlier, Gordon’s 2005 victory surprised a lot of people, said Garwood, who served as Gordon’s campaign manager that year. After the relative upset and the loss of two Green Party incumbents, Gordon became the only non-DFL candidate on the council. He said he needed to demonstrate early on that he could work across party lines if he wanted to get anything done. “It put me in a position early on where I had to demonstrate that I could work with everybody on the council despite the party difference,” he said. After tight council races in the past, Garwood said this year’s opponent-free election cycle has been a lot less stressful, and people seem to be happy with the work the councilman has done for the ward. “What we hear from folks is that they feel well represented, and there’s not a particular need they feel to run somebody against him,” Garwood said. Dan McConnell, chair of the Minneapolis DFL, said even DFLers in the ward seem content with Gordon, which explains why no candidate has opposed him. “I think a lot of the people in the DFL support Cam and think that even though he’s not a member of the DFL, he does a good job,” he said. Gordon’s transparency and readiness to step forward on issues make him an admirable councilmember, Johnson said. He said Gordon’s interaction with constituents — like his regularly updated 2nd Ward blog — is unprecedented on the council. “As I run for City Council I look to him as a role model for what a councilmember should be,” he said. Johnson, president of the Longfellow Community Council, said Gordon shows up to nearly all of the neighborhood’s meetings with an open ear.